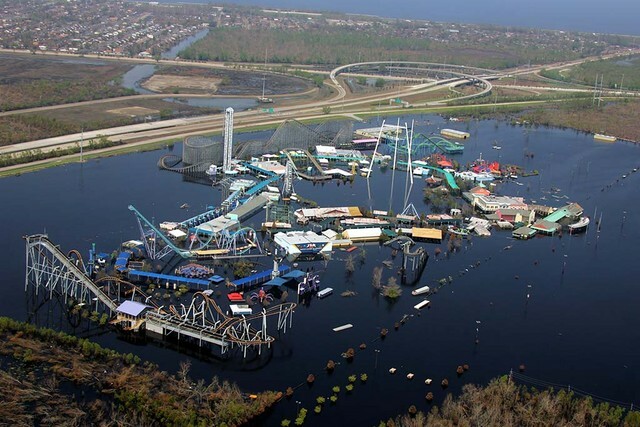 Ah, Jazzland. At least that’s what it was called on the 1 time I made a paid visit to the park. Not bad – $4 beer, decent roller coasters. 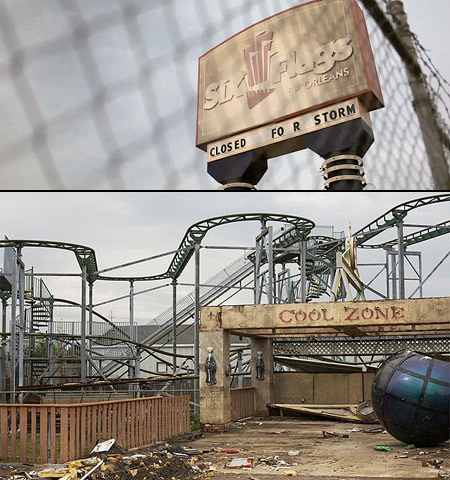 Since then, Six Flags took ownership, Hurricane Katrina happened, and now we have a colossal urban ruin that can hang with the top 10 in the US. Oh yes, nature has taken over. I was recently called to work on a film shoot in the park to do some “wet” photography in the park’s little pond that was once the arena for their spectacular waterski show. They assured me that the pond was now “gator-free” because an animal wrangler had been fishing out 10 footers all week. Water + Time = Decay. BTW, we’ll be closed for the storm(and then some). You’ve probably already seen it, but this haunting short film is the best movie featuring the park. Nice job. Anyone else been there? Got some good photos? That video is beautiful. I’m so glad someone captured it before the demo. In the video: much like the world would look like if humans were to just disappear.